WHAT’S HAPPENING TO CITY PLACE? In other forums, Gavin is making it clear that he’s personally in favour of building a bus-way through City Place because the Transport Department is ready to act on it quickly. He’s been persuaded to give up on his earlier suggestion of a “CBD loop bus”. On 13 September I also had a meeting with Cairns Mayor Bob Manning to discuss City Place and Cairns Transit. Mayor Manning said that he had no confidence in the present Transport Department planning. He didn’t see why busses needed to flow through City Place, and was worried that the interface with adjacent blocks of Shields St had not been properly considered. He believed that the business interests in adjacent buildings along Lake and Shields St were obligated to be part of the solution. Bob’s principle interest lies in creating a commercially viable CBD that reflects and adapts to modern changing social patterns (outlying shopping Malls, outlying Council building, inner city apartments, Cityport). He likes the idea of a loop bus service, and is in touch with potential commercial providers. Mayor Manning identified conflict with Gavin King over the location of decision-making authority. Bob thinks it ought be the Cairns Regional Council, and the scope of decision ought be fully open, not determined by the Transport Department. Having said all that, Bob’s personal view is that City Place ought be opened up to all traffic, and Shield St be improved as a pedestrian and civic space. 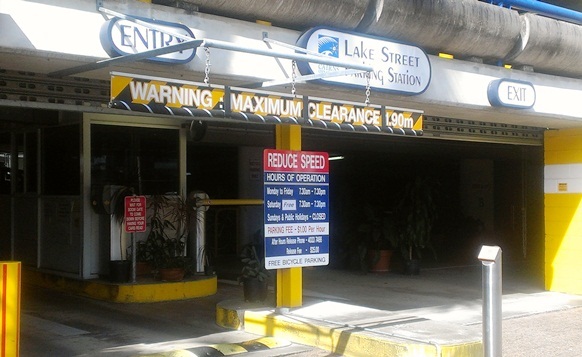 Need more parking near City Place - here's a whole bunch that's under-utilised. Whatever the decision is, it has to be made by Christmas with construction to begin after this wet season. Mayor Manning would like 70% to support the decision, but will take 50% +1 if necessary. He doesn’t yet know who’ll drive the consultation (but it won’t be him). Say off the record that the $5 million is locked up in the Transport Department’s budget, and WILL ONLY be used to make roads or other hard transport infrastructure. If the Department prevails the only decisions being made by Cairns Regional Council will be about the street furniture, landscaping and facilities – that Council will have to find the money to pay for. I don’t know if this is true. I think some elements of the LNP would like to demonstrate political virility by committing to quick decisions, rather than effective ones. That kind of push from inside the tent would certainly explain Bob Manning’s continuing reference, throughout our meeting, to the Transport Department’s drawing of a bus-lane through City Place. If the Department prevails due to nonsense like that, I’m going to be very disappointed in Gavin King, and in the Cairns Regional Council. I met with Steve Minnikin (Assistant Minister for Public Transport) during the community cabinet process on 16 September. He began by acknowledging the importance of that location in any city, in any democracy, where civic and political forums are conducted among the people. He acknowledged that ANY plan would need to provide such a space. At the moment there are vague proposals about where that space might be relocated to if City Place can no longer function that way, these proposals will need to be further developed. Assistant Minister Minnikin promised that he would give the CBD proposals a full and proper examination. He said very definitely that the principle drivers of any plan MUST BE the Cairns Regional Council as local government authority. In Steve’s hierarchy of decision-making the local member, Gavin King, has a significant say, as does the Chamber of Commerce. Citizens and groups are only one factor, and ought feed into or at least engage the three principal players. Steve plans to consult with all players, and to seek advice from relevant officers of the Transport Department. Gavin King joined us for a while, and contributed to discussion of the “CBD Loop Bus” concept. He said that for him the loop bus was rendered unfeasible by a recurrent cost of “minimum $600,000”. That’s a realistic cost for wages etc, and the bus would fail to function if fare or fee collection was required. Steve Minnikin agreed (emphatically) the state government was not in the business of paying recurrent costs for such a service. The floor is open for a solution which wins support from all the major players. The solution must address the civic uses of City Place (forums, speakers corner). If a “CBD Loop Bus” is to be adopted, there has to be a business model that raises $600,000 pa to operate it. If there’s no Loop Bus, then the Transport Departments plans for trunk bus services in the CBD has to be closely scrutinised. The Cairns Regional Council, led by Mayor Bob Manning, has promised a speedy and inclusive process that will make a decision before Xmas. 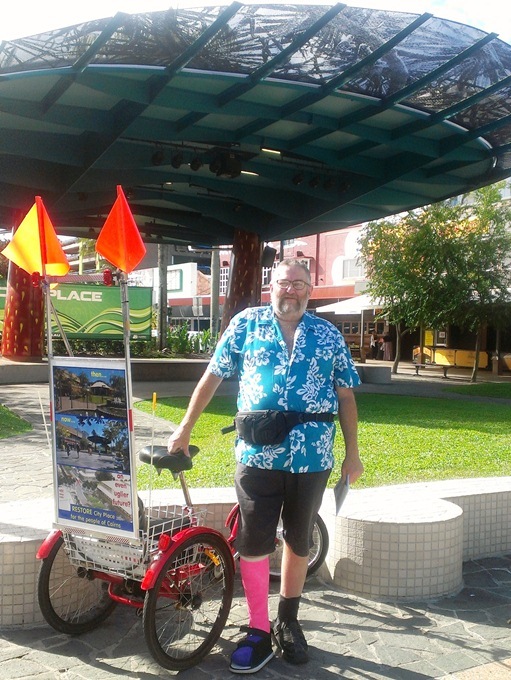 The author in City Place, with tricycle. 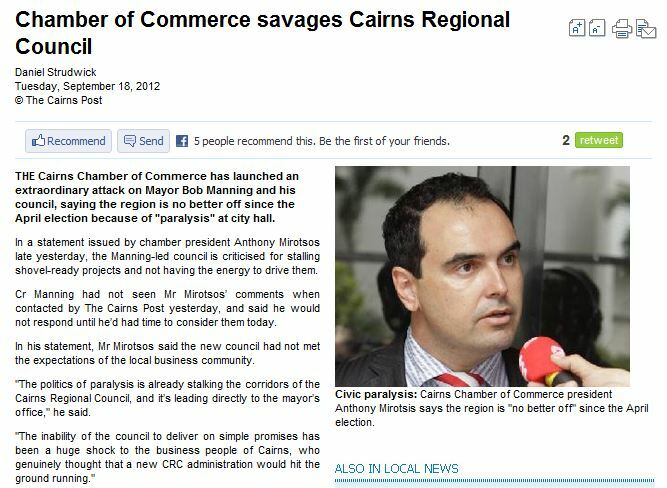 President Anthony Mirotsis of the Cairns Chamber of Commerce has launched an extraordinary attack on Mayor Manning and the Cairns Regional Council for not building the busway already. I think he’s been taking too many amphetamines.